Gutters protect your roof, walls, and foundation from damaging rainfall. Gutters provide an invaluable service for your home. As rain falls, gutters collect water and direct it away from your vulnerable roof, walls, and foundation. In the absence of gutters, rainfall would quickly infiltrate and deal serious damage to your home. Though cleaning your gutters can help extend their life, all homes need gutter replacement at some point. To know whether this time has arrived for your home, look for these signs. 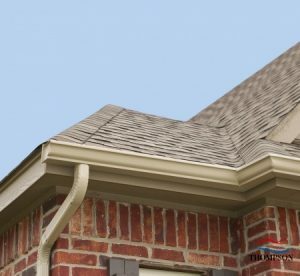 If your gutters have begun to sag or separate from the house, then you probably need gutter replacement. Sagging gutters generally occur when the gutter system becomes too full of water or debris. This suggests that the gutter system has either reached the end of its usefulness, or was never appropriate for the home in the first place. Water or mildew that has gathered around your foundation indicates malfunctioning gutters. Remember, gutters should direct water away from the house. Water that leaks or overflows from gutters can seep beneath the foundation to cause cracks and other damage. Peeling paint and rust can indicate two things, both of which suggest you need gutter replacement. On the one hand, peeling paint and rust can indicate aged gutters; on the other, they can suggest that water does not get correctly directed out of the gutters. Cracks or leaks in your gutters mean that they cannot effectively do their job. Water that seeps from your gutters can damage your fascia or walls, and seep up into your roof. If your gutters have begun to leak, it’s time to say goodbye. If leaking gutters have damaged your roof, contact Thompson Roofing and Siding today at (573) 789-8367. We are your roof and siding experts for Lake Ozark, MO. Posted in Uncategorized on January 22, 2019 at 4:00 pm by Thompson Roofing & Reconstruction.